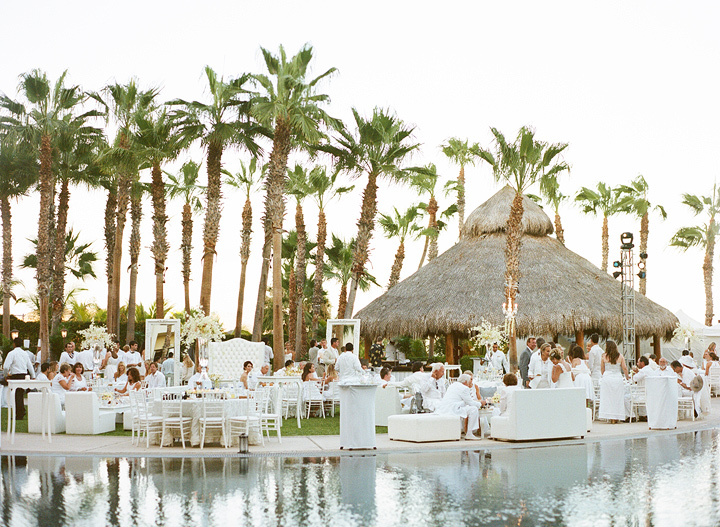 Every bride wants her destination wedding to be a unique, memorable experience for all of her guests. When it comes to wedding décor, some ladies choose bright, eye-catching colors to make a statement, while others make the bold decision to stick with classic hues. But when Washington, D.C., bride Ashley came to us with her vision of an all-white affair, the result was a glamorous celebration we will never forget! Ashley and her fiancée Matt are well known among the young people on the Capitol social circuit, so we knew we would have to do our best work to design an impressive event for their much-anticipated Cabo wedding. Ashley wanted a clean, modern look for her reception, which included 200 of the pair’s closest friends and family. For an event of this size, we knew it was important to be resourceful with the décor texture and lighting in order to keep the tables from looking too flat—a major concern with using only white. We created contrast by using textured linens, and we worked closely with the florist to make sure the centerpieces stood out as well. The floral team did a fantastic job of creating two tall centerpiece designs for the round tables and a contrasting cascade bouquet for the bride and groom’s table. The lighting team at the Hilton also created the perfect shades of aqua blue and purple to keep the white setup looking fresh after dark. The couple’s main concern was creating a good flow throughout the reception area so their guests could mingle freely with plenty of room to dance. Since they did not want a traditional sit-down dinner reception, we were able to get creative with the seating arrangement and combined oversized chairs and chaise lounges with cocktail and coffee tables. We also incorporated a few large round tables for those who wanted a more traditional seat. There were so many unique pieces brought into the design of this reception, but our favorite by far was the one-of-a-kind sofa and sweetheart table we had custom-made for the bride and groom. We loved the table so much that we decided to make the other tables a similar Baroque style. The contrast of the bold curved table legs against the modern mirrors and clear chairs kept the vibe fresh and light, just as Ashley imagined. This event was special to us on so many levels, but most of all we truly appreciate the trust Ashley and Matt placed in us to design their most important social event to date. We must thank Gaby for giving us so much creative control of this party, and we also send a sincere thank you to all the professionals we worked with to make this one of our best weddings ever! This entry was posted in Accessories and decor, Cabo event design and decor, High end set-ups, Linen collection 2012, Wedding flowers Cabo, wedding locations in Los Cabos, Weddings and corporate events decor and tagged Cabo decor, CABO FLORAL STUDIO, CABO LINENS, cabo wedding, destination wedding Cabo, high end wedding, Hilton Los Cabos, Los Cabos celebrations, Vivid Occasions, Wedding design, wedding flowers. Celebrate your Los Cabos Holidays in style! Learn about new decor trends and some tips for your wedding or special event.